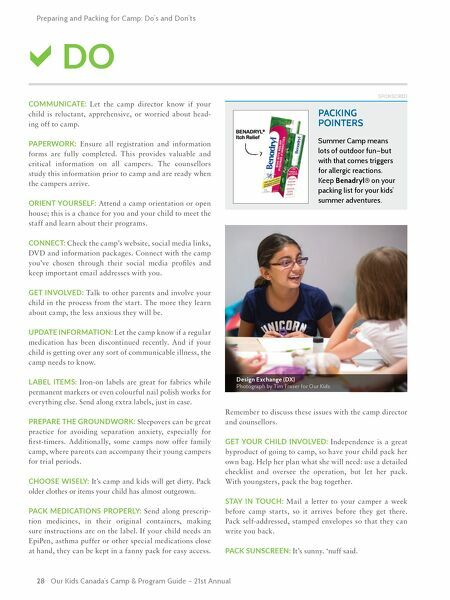 Find Camps & Programs at www.OurKids.net 29 Preparing and Packing for Camp: Do's and Don'ts FORCE IT: Don't force your youngster to attend camp. Be sure they are ready, willing, and able. MAKE PROMISES: If your camper is reluctant, suggest that they "give it their best," and tell them that you will re-evaluate for next year. Never suggest that you will come pick them up if they don't like it. Instill the expec- tation that they will stay for the entire session. Even the most apprehensive camper will often surprise Mom and Dad with: "I want to go for a whole month next year!" PRESSURE: Don't set your child up for disappointment by overselling how wonderful the camp experience was for you. Stay positive but let them enjoy camp in their own way. WORRY: Stay positive about your child's camp time. Don't dwell on telling them how much you will miss them (though you will), and don't overplay all the "fun" things you have planned while they are away. Encourage them to enjoy camp their way. SEND VALUABLES: Money, cellphones, and jewelry are not needed at camp. Crafty campers will create their own new bracelets and other adornments. CRITICIZE: Don't criticize or belittle your child if their camp experience isn't totally positive. Be encouraging. OVER PACK: Follow the camp's guidelines. Each camp offers suggestions on what to pack and how to pack. They've done this before—heed their suggestions. HOVER: Camp directors and counsellors are focused on the campers. Don't send them daily emails, letters, or phone calls to check up. If there are issues, they will contact you. If you need to touch base, once a session is sufficient. PROCRASTINATE: Don't leave things until the last min- ute. Pack ahead of time. PUSH: You're a keen kayaker who also loves long hikes and wilderness excursions. Your son prefers the arts and drama programs. Don't push your kids to follow your trail. Let them blaze their own. 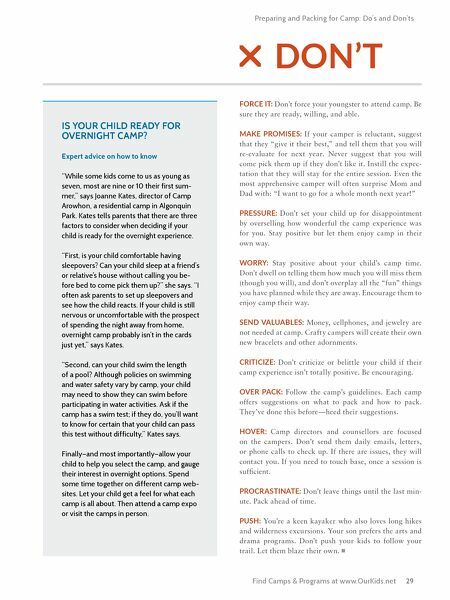 DON'T IS YOUR CHILD READY FOR OVERNIGHT CAMP? Expert advice on how to know "While some kids come to us as young as seven, most are nine or 10 their first sum- mer," says Joanne Kates, director of Camp Arowhon, a residential camp in Algonquin Park. Kates tells parents that there are three factors to consider when deciding if your child is ready for the overnight experience. "First, is your child comfortable having sleepovers? Can your child sleep at a friend's or relative's house without calling you be- fore bed to come pick them up?" she says. "I often ask parents to set up sleepovers and see how the child reacts. If your child is still nervous or uncomfortable with the prospect of spending the night away from home, overnight camp probably isn't in the cards just yet," says Kates. "Second, can your child swim the length of a pool? Although policies on swimming and water safety vary by camp, your child may need to show they can swim before participating in water activities. Ask if the camp has a swim test; if they do, you'll want to know for certain that your child can pass this test without difficulty," Kates says. Finally—and most importantly—allow your child to help you select the camp, and gauge their interest in overnight options. Spend some time together on different camp web- sites. Let your child get a feel for what each camp is all about. Then attend a camp expo or visit the camps in person.